Call this charming 2-bedroom, 2-bath Laurel vacation rental house home while visiting historic Maryland! Hosting up to 6 guests, this newly renovated abode brimming with essential amenities features an ideal location between Baltimore and Washington, DC. Enjoy a quick drive or train ride into these 2 popular cities to visit attractions like the National Mall, the Smithsonian National Museum, and Jonestown. Plus, you're within walking distance of Main Street and the Patuxent River. Just like home, this cozy 1,300-square-foot bungalow-style house features numerous amenities including wireless internet connection and in-unit laundry machines, making your stay more than comfortable! In the open-concept living area, relax on the plush couch while watching your favorite shows on the 55-inch flat-screen cable TV or start the new novel you've been dying to read. If you'd rather be outside, enjoy a leisurely stroll through the Riverfront Park where you can take in the sights and sounds of the Patuxent River. Eating in is always an option with a fully equipped kitchen! Stainless steel appliances and ample counterspace make home-cooking a breeze during your stay. Savor all of your flavorful creations around the 5-person dining table. Finish the day with a cleansing shower in one of the 2 full bathrooms stocked with complimentary toiletries and fresh towels. Thoroughly tired, crawl into the master bedroom's queen-sized bed for a peaceful night's sleep. Additional guests will sleep soundly in the second bedroom with a full bed or the recreation room with a king bed. Boasting a prime location between Washington, DC and Baltimore, this Laurel rental property provides guests with easy access to numerous attractions, all found within an hour of the home! Hop aboard the MARC Train to venture to downtown Washington, DC, only 1 hour away! Visit popular destinations including the National Mall and Memorial park. Brush up on your history at the Smithsonian National Museum and the world's second largest Holocaust Museum. Afterward, grab a bite to eat at one of the superb restaurants found in the area. Head in the opposite direction to find Baltimore, 36 minutes away, known for its long history as an important seaport! During your visit, make sure to check out the National Aquarium, American Visionary Art Museum, and historical places such as Jonestown and Little Italy. You'll also find numerous shopping and dining options in the area. In the colder months, head north for a fun-filled day of skiing or snowboarding at Liberty Mountain Resort or Whitetail Resort, both located within an hour and a half of the property. Stay in town to check out the shops and restaurants on Main Street! Olive On Main offers mouthwatering Mediterranean fare while Sweets and Treats Creamery Cafe will satisfy your sweet tooth. 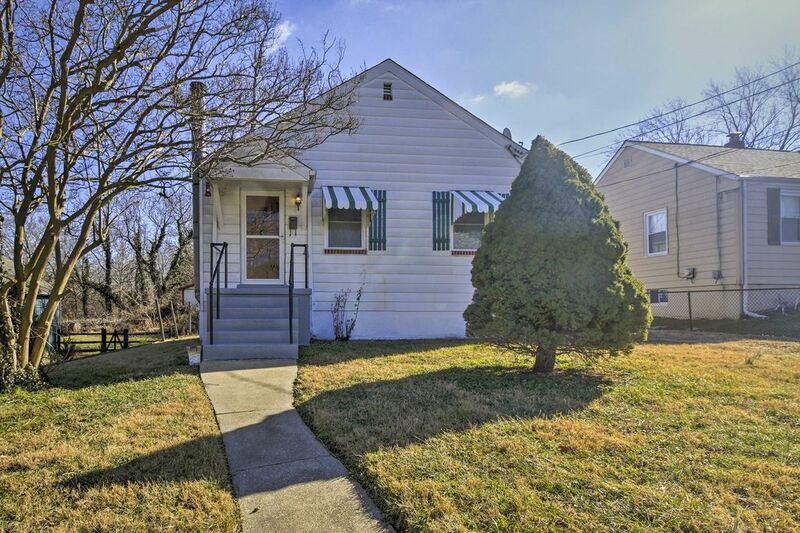 - Peaceful Laurel location- Within walking distance of Main Street, this Laurel home boasts a prime location between Washington, DC and Baltimore. Enjoy easy access to popular attractions including Jonestown and the National Mall along with excellent restaurants and shopping! This was a cozy place to stay on a quiet street in Laurel. Main Street was very close and there were two good places to eat there: Oliver's and Olive on Main. Very near the house was a path along the Patuxent River that we enjoyed. It was convenient to get to the MARC train station and ride into Washington. The train station has an automated machine for purchasing tickets. One day we opted to take a Metro train to DC. We enjoyed our stay so much that we discussed returning to Laurel to visit other historical sites in 2020. This was a cute little house, it sleeps 6. This is a great location, as you are within 30 minutes of Washington, Annapolis and Baltimore National Harbor. The manager was great at responding to concerns, as we locked our keys in the house. The home has 2 bathrooms, but the shower downstairs (basement) is hard to use. It has been remodeled, but my grandson and family used the upstairs shower. The basement bedroom is very nicely done. The Boatyard Grill in Annapolis is fantastic, the best crab cakes you will ever eat. The Hideaway near Laurel also has great food, good pulled pork. Known for their chicken. Both restaurants are noisy, so don't expect a quiet meal. Another good restaurant is Mission BBQ. The home is also within walking distance to local restaurants in town. Then 4 stars are mainly for its location. The home itself I would give 3 stars, but I would stay there again. Nice place. Close to where we wanted to be. We liked the house . We didn't like the wasps in the house that stung one of our party . The house was very clean and nice modern appliances. We slept well in nice comfortable beds . We would stay here again . Thank you for the nice stay. This house is so wonderful! There is a surprise bonus with this house.... You will have to rent it to find out what it is... but I will say that it has to do with the house being much more comfortable than you can imagine. The owner is very nice and personable and has made her house very comfortable for her guests - you can tell that she really cares, and also knows how to respect privacy and vacation time. The house is located in a quiet sleepy neighborhood with quality surroundings and a nature trail less than two houses away. There are two restaurants with full bar each within short walking distance. There is also a liquor store and a convenience mart within a 12 house walk which do not come up in google search but they are there. The bathrooms are very nice at this house with a good flow of shower water. There is fast wi-fi at the house and plenty of room for spreading out and getting work done if necessary. I have been to a lot of rental cottages and houses and this one is by far one of the best. There are good laundry machines in the basement and the climate control is virtually self contained not requiring any adjustment. The house is warm and cozy and the beds are comfortable. It made my week in DC absolutely fantastic.